In the first match of the new season, league champions Chelsea draw at home to Swansea City. The Chelsea goalkeeper is sent off for a rash challenge.In the press conference after the game, Chelsea manager Jose Mourinho criticizes Eva Carneiro, the club doctor, for attending to an injured player late in the game, an action which had forced the team briefly to continue with nine players on the pitch. He subsequently banned Dr Carneiro from the touchline in future games. Her future at Chelsea is in doubt. For a long time, many people have suspected that the Chelsea manager has superhuman powers. He is known as The Special One, a description that he never denied. His special gifts extend to never making a poor decision requiring him to admit fallibility. Infrequently his explanations suggest that a match strategy has not been successful, but his true followers explain this as part of his genius at taking the blame for his players’ errors. Now we know the truth. His gift is all the more remarkable in that the doctor in question, Eva Carneiro is herself a highly respected medical expert and a role model for women in football. Last year she spoke at an international conference on the challenges to women in making a career without being stereotyped as ignorant of the game and for unable to see from the touch line whether a player was really injured or just having a rest by falling down when tired. Even before Mourinho banned her from such foolish actions in future games, he was accused of inappropriate behaviors for pointing to the error of her ways in such a public manner. The article by football journalist Sam Wallace writing in The Independent [Monday 9th August, 2015] typifies such ill-informed attacks on the Chelsea manager. It was only on Friday that Mourinho described his faith in the medical team as “complete” when discussing Diego Costa’s injury. What has changed since then is the innocuous Facebook post from Carneiro on Sunday night in which she thanked people for their support. It appeared that these nondescript few words of gratitude had sealed Carneiro’s fate and that her time at Chelsea was as good as up. As a high-profile woman who has taken sexist abuse from opposition fans wherever she has worked Carneiro had become a pioneer in her field for women in sports medicine. It is time for mere mortals to acknowledge their errors. In my studies of charismatic leadership I am aware of the evidence that charismatic leadership is often associated with narcissism and in extreme cases with megalomania. While examples of this kind of leader can be cited, I wish to make it clear that the general observation is not intended to apply to The Special One, Jose Mourinho. After all, I am not a medical expert. Nor do I have special powers. The Story rumbled on. 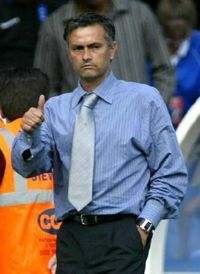 One commentator suggested that Mourinho ‘has driven blindly into a public relations car crash’ . As I was updating this post Chelsea in their next match incurred a double injury requiring attention from their depleted medical staff. Additional on field medical support was provided by the opposing team. This entry was posted on Wednesday, August 12th, 2015 at 6:20 am and is filed under Uncategorized. You can follow any responses to this entry through the RSS 2.0 feed. You can leave a response, or trackback from your own site. Mourinho should apologise to Eva Carneiro. Surely he should have shared his thoughts in private with Eva Carneiro rather than criticise through the public domain. Strange. Mourinho is usually so calculated in his approach … maybe there’s a deeper motive?